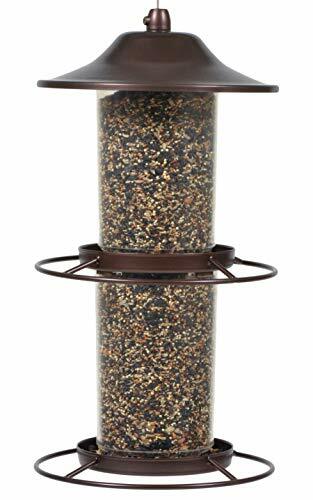 The Perky-Pet Panorama Wild Bird Feeder features our innovative Evenseed technology. This technology is like having 2 feeders in 1. Two independent seed compartments are filled and emptied separately, allowing the ports to stay active longer. Both compartments can also be filled with two different types of seed, thus attracting a larger variety of birds. With this feeder's 4.5 lb seed capacity, the Panorama Wild Bird Feeder provides plenty of seed to go around. The Sure-Lock cap system ensures the lid stays in place and no squirrels can get to the seed. Another great feature on this feeder that helps keep squirrels out while allowing birds to have access to the seed. Remember to clean your wild bird feeders every two weeks with a mild soap and water solution. Squirrel Buster Standard is a squirrel proof wild bird feeder with a lifetime warranty. It is easy to clean and to fill. It is weight adjustable to exclude larger birds, and no tools are required to assemble it. Holds 3/4 quarts of seed. LIFETIME CARE: you only need to buy one of our products, and we will guarantee to service your feeder for free for the rest of your life! TRULY SQUIRREL PROOF: the weight of an adult squirrel automatically closes the shroud denying access to seed. NEED FOR CLEARANCE: hang providing an 18-inch/47-cm CLEARANCE on all sides. CHEW PROOF: all feeder parts exposed to squirrels are made of chew proof materials. NO TOOLS REQUIRED: our feeders are designed to be dismantled by hand into individual components without the use of tools. 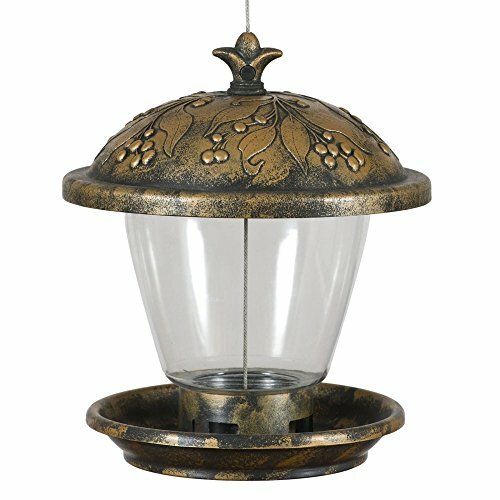 The Perky Pet Plastic Antique Copper Chalet features a distressed bronze finish that underscores its antique-inspired charm. This feeder, which holds two pounds of seed, arrives with a hanging cord. Dimensions: 7.5L x 7.5W x 9.5H in.. Constructed of plastic. Features bronze and clear finish. Attracts variety of birds. Includes hanging cord. Features 4 feeding stations. Dimensions: 7.5L x 7.5W x 9.5H in. With a dishwasher-safe jar, the More Birds Vintage Hummingbird Feeder meets your need for convenience while uplifting the aesthetics of your outdoor space. 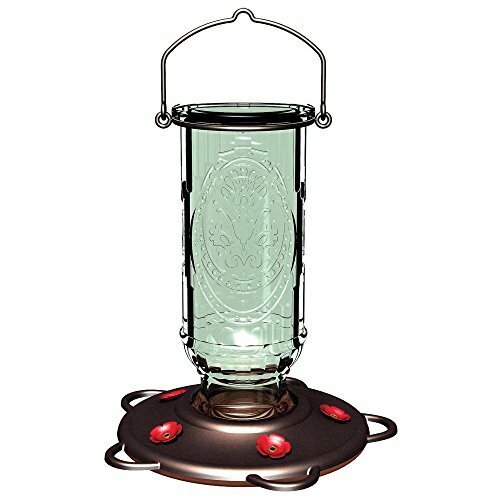 Glorious as a gift, this hummingbird feeder attracts beautiful hummingbirds from all over the neighborhood. Five tiny metal perches allow your tiny guests to dine in comfort. The bottle holds 20 ounces and stands flat on the counter for easy filling. Red flowers are built into the metal feeding station to attract birds' attention. Dimensions: 8L x 8W x 8.98 H in.. Made out of glass. Clear and bronze finish. To be used by hummingbirds. Hang with metal hanger. No extra hardware. Features 5 durable perches at base. Dimensions: 8L x 8W x 8.98 H in. 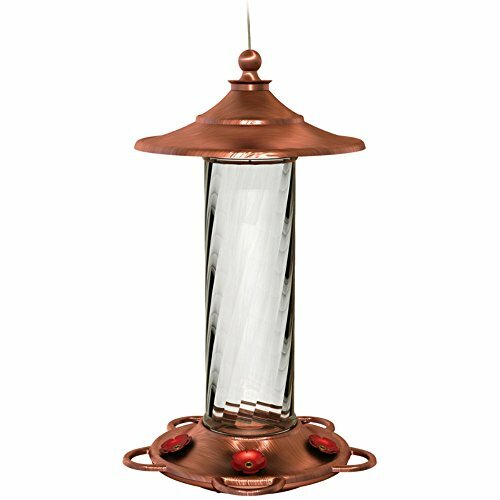 An elongated tube style and bronze finish are defining features of the More Birds Glory Hummingbird Feeder. This feeder is constructed from glass with a wide mouth for convenient refilling. It has a 14-ounce capacity and a built-in ant moat. Dimensions: 6.4L x 6.4W x 10.5H in.. Made of glass. Features bronze and clear finish. Designed for hummingbirds. Comes with hanging cord. 5 feeding stations. Dimensions: 6.4L x 6.4W x 10.5H in.